Baked beans are a British institution. They’re served on toast, on baked (or to give them their proper English name: jacket) potatoes and, of course, they are a vital part of the one meal no Brit can live without: the full English breakfast. By why should they be bland and full of preservatives? Why shouldn’t they be coated in a thick, rich sauce full of spice and smoke? I think they should. So when we decided to host a belated Fourth of July barbecue this past Sunday, I got out my biggest pot and went to work. Now, I didn’t use just one kind of bean, but three: borlotti, cannellini and haricot. I used twice as many cannellini beans as the others because I like them, but you could use kidney beans or butter beans (yum!) or whatever beans you like! I might omit the haricot beans the next time because they don’t get as buttery soft as the other types of beans. They have this bite to them that would probably work wonderfully well in a salad, but here it meant that the slow-cooked, tenderness of the beans was ruined from time to time with one I actually had to chew. It’s a hard life. I can never remember exactly what I put in my baked beans, so it’s different every time. Maybe this blog will act as a bean register where I mark down ingredients for future use or exclusion based on the overall flavor profile I’m hoping to achieve with that particular pot of beans. Or maybe that’s taking baked beans a little too seriously. In the meantime, this is one pot of beans that has it all: sweetness, smokiness, substance and spice. Having had the leftovers for lunch a couple days after the barbecue, I can say with certainty that they will only get better the longer they sit around. Before I start getting harassed with cries of, “Where’s the bacon? !”, “She didn’t use any bacon! ?”, let me assure you that this was intended to be a vegetarian pot of baked beans. Unfortunately, at the last minute, and obviously thinking like a carnivore, I threw in some beef stock – surely it’s still considered vegetarian, isn’t it? It’s only a broth made from water…and the bones of dead cows…that won’t bother anyone, right? Damn. Had I intended this to be non-vegetarian from the beginning, there would have been heaps of piggy bits in there. I guess that ultimately means I’ve made a pot of beans that doesn’t satisfy the veggies because it contains beef stock and doesn’t satisfy the meat eaters because it doesn’t have any bacon. I also didn’t bake these…so I don’t actually know if I can call them baked beans. Who makes all these rules anyway!? If I haven’t totally put you off this recipe, they were still pretty tasty. 2. Add onions and sweat until slightly translucent. 3. Add spices, herbs and sugar and cook fro 2-3 minutes. 4. Add ketchup, mustard, sriracha, bay leaf and enough water so the beans are submerged. 5. Cook simmering for an hour and a half, stirring occasionally, until the sauce is reduced and thickened and the flavors are melded. Alternatively, baked uncovered in a low oven for 1-2 hours, stirring occasionally. *South Devon Chilli Farm is an excellent source for all sorts of chilli fun! You can use any mixture of chillis you like, the Guajillo is a bit fruity and mildly spicy and the chipotle is smoky and spicy, so I thought this would be a good combo. You can also rehydrate them and blitz them (sans the seeds) into a paste to add into the beans, but i this case I left them whole and removed them after the beans were cooked. 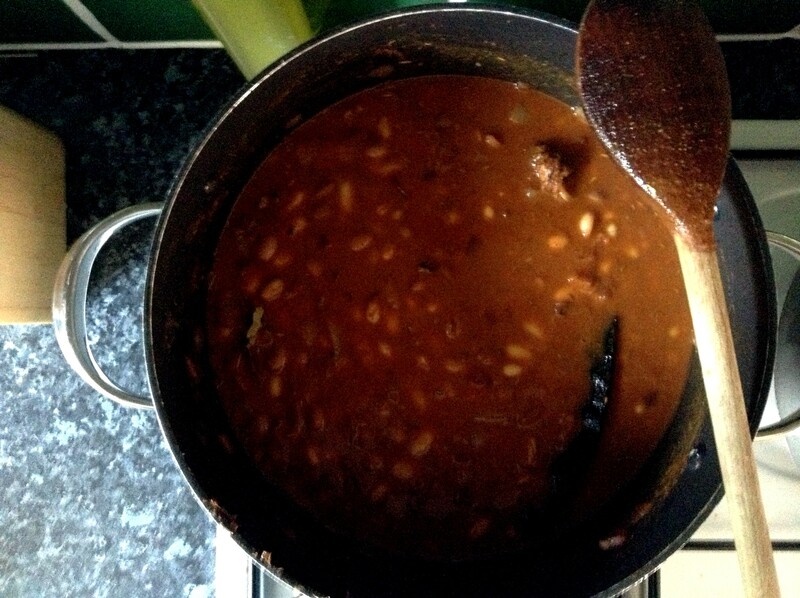 Whenever I am in London, I always try to have baked beans at least once… a day (well, maybe not every day, but at least once !). I have never made my own, what a great idea!!! You will never eat canned ones again! You’re right. Beans for breakfast makes me think of B&Bs across the UK. But you can’t have a real Fourth without them, either. On the Fourth we had baked beans from a Sunset cookbook from the 60s with bacon and pineapple. That was great! I love beans. The UK beans lack a little oooomph, but I still enjoy the English breakfasts! I taught both of my daughters to cook beans because they’re so inexpensive, and healthy. I can buy a pound of beans for about a dollar, which is about 70 pence! You’re right, beans are great! You can do almost anything with them and they cost pennies! These look incredible. 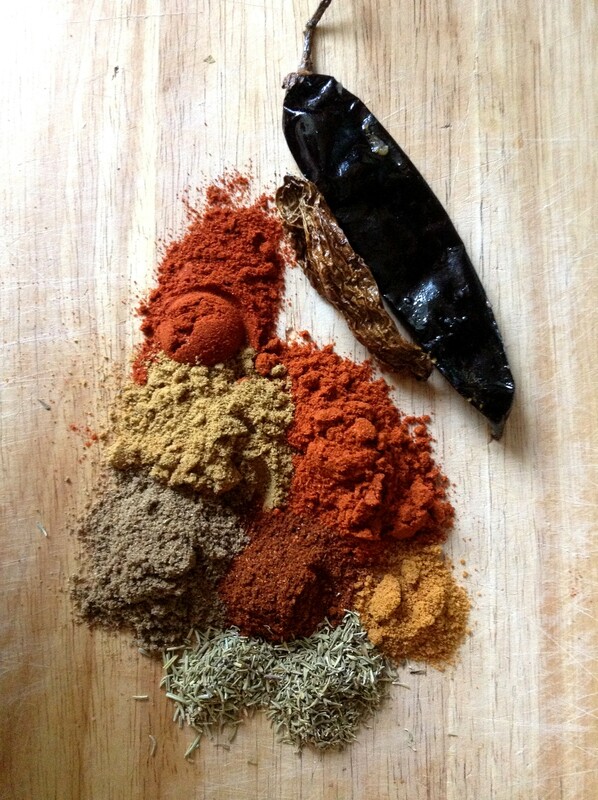 Your pic of the spices is gorgeous. Is it ironic to celebrate the 4th of July in England? Haha, I guess I never really thought about it! There is a house next to the garden where we have our barbecue each year which always flies the American flag on Fourth of July, so it’s nearly like being at home!